If one wanted to understand the characteristics of the housing stock in the US, including its size, composition, physical conditions, home improvements, characteristics of recent movers, and housing costs, the American Housing Survey (AHS) would be the place to go. The AHS is conducted every other year by the Census Bureau and sponsored by the Department of Housing and Urban Development (HUD). This post will focus narrowly on data showing that American homeowners have significantly cut down on the amount of money they spend improving and repairing their homes. 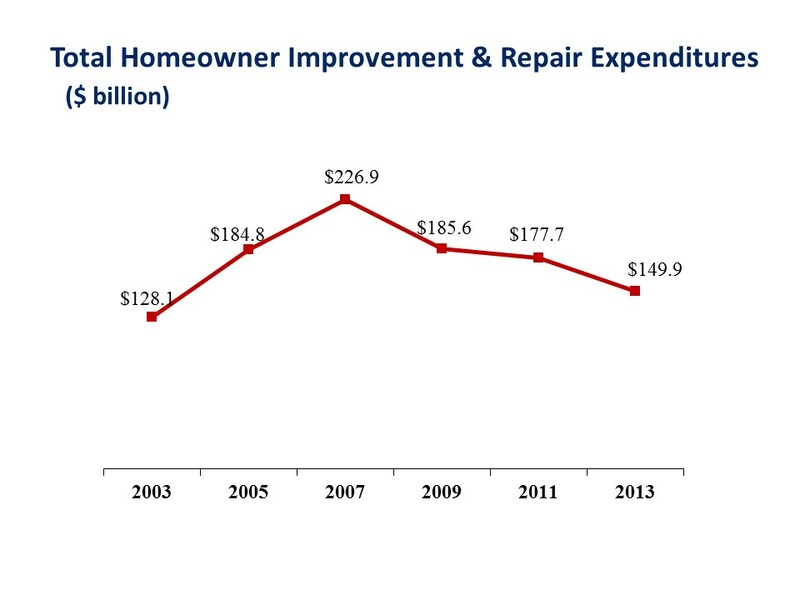 According to NAHB analysis of the most recent data, home owners spent about $150 billion on home improvements and repairs in 2013. That was 34% less than in 2007 ($227 billion), 19% less than in 2009 ($186 billion), and 16% less than in 2011 ($178 billion). In the 10 years included in this analysis, total homeowner remodeling expenditures have only been lower once: in 2003, when they were $128 billion. The AHS data also allow us to see total expenditures by job type. In 2013, for example, the three jobs with the highest expenditures were roofing ($18.2 billion), kitchen remodels ($13.0 billion), and disaster repairs ($12.2 billion). The same three jobs ranked highest in 2011, but not in 2009. That year, kitchen remodels was first ($19.6 billion), followed by roofing ($17.2 billion), and bath remodels ($11.7 billion). * Number of households undertaking each type of job in 2013. The majority of jobs listed above saw their levels of expenditure fall in 2013, and for many that was yet another decrease following losses in 2009 and 2011. The addition/replacement of pools, tennis courts or other recreational facility, for example, fell by 34% to $2.5 billion in 2013; while the addition/replacement of doors and windows fell by 30% to $8.4 billion. There were, however, a few jobs that saw increased levels of expenditure from 2011 to 2013, including added bedroom onto home (up 80% to $4.2 billion), created bedroom through structural changes (up 21% to $1.1 billion), and added bathroom onto home (up 9% to $950 million). It is also worth noting that homeowner expenditures on disaster repairs were 150% larger in 2013 than in 2003, rising from $4.9 billion to $12.2 billion. The most frequent type of job in 2013 was the addition of wood/tile/marble/vinyl flooring, undertaken by 10.3 million households that year, followed by the addition or replacement of plumbing fixtures (9.4 million), and the addition or replacement of windows and doors (8.6 million homeowners). Can you please give links to the data you mentioned?